Our boys both have narrow hips and skinny waists. 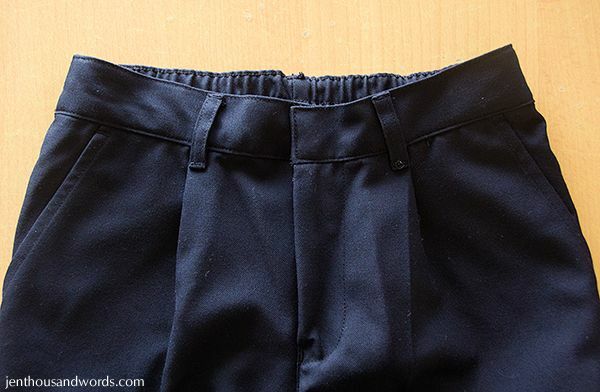 I've always struggled with getting pants that fit in the waist but are long enough in the leg. I love the trousers and jeans that come with the adjustable elastic but alas, not all of them do. 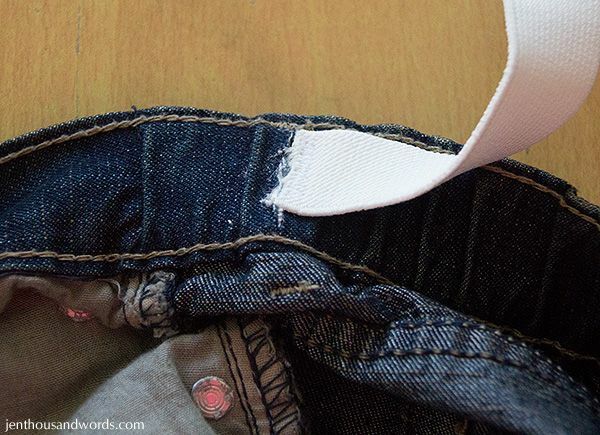 I have had to come up with a way to adjust them as Daniel and Noah both hate wearing belts (and when they do they invariably leave them on the pants when throwing them in the wash, which annoys me). 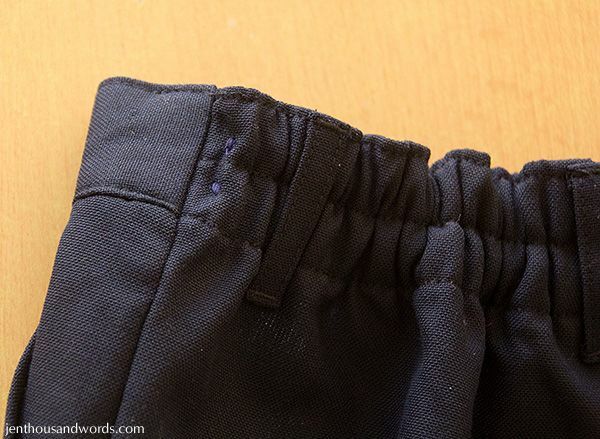 I thought I'd share how I have adjusted Noah's school trousers and jeans with elastic in the waists. 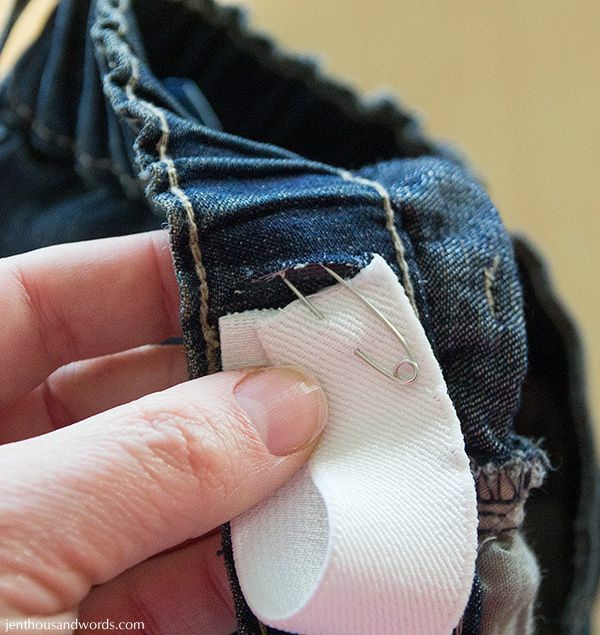 Tip: this also works with ladies' jeans to help with the gape at the back of the waistband. 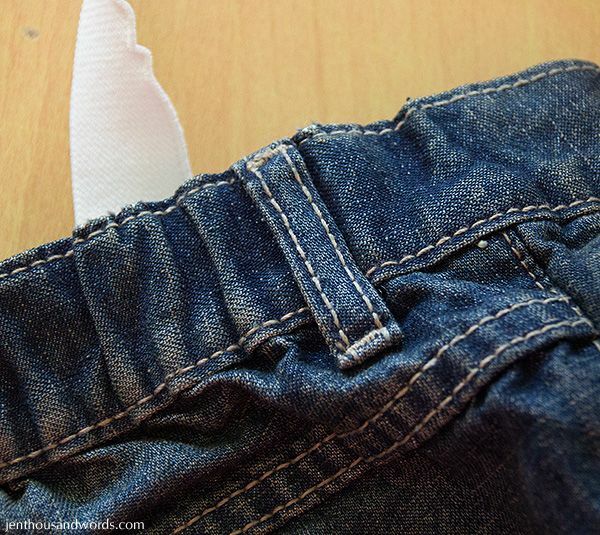 You know, sometimes when you buy jeans to fit your thighs / bottom they are a little loose in the waist - this will work. 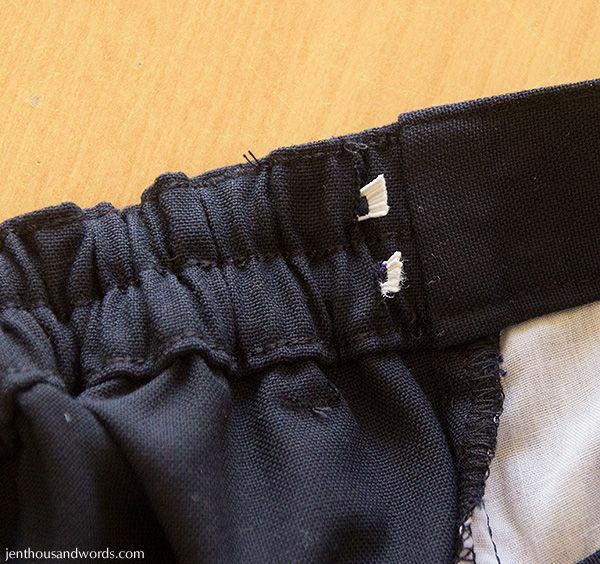 The back is elasticated, but they are still too loose for him. Then I attached a safety pin and threaded one through the channel. And repeated with the second one, fastening it with the same pin. 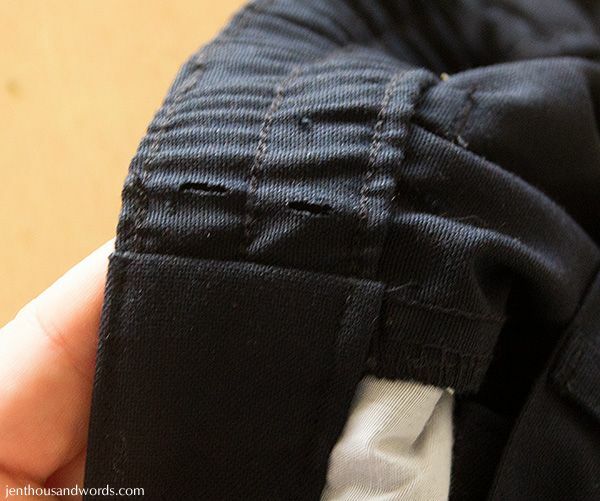 Then I stitched both elastics down, removed the pin and trimmed the elastic. 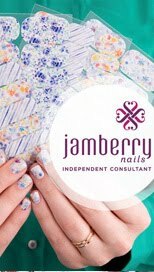 Here's how it looks on the outside. 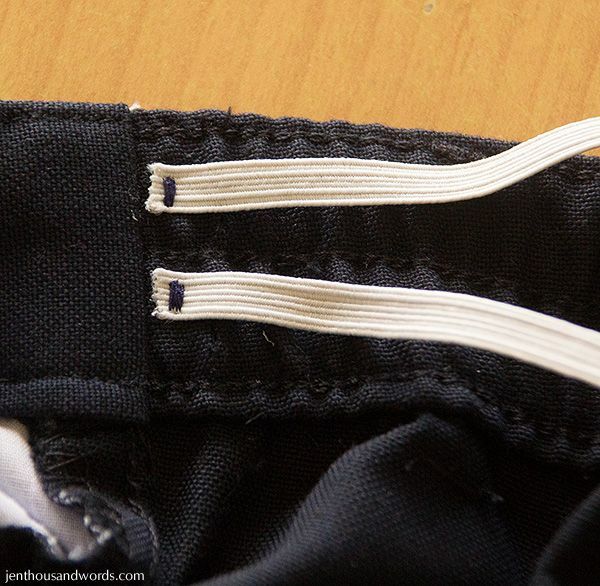 I just used the navy thread that I had; with a better colour match you wouldn't even notice the stitching. 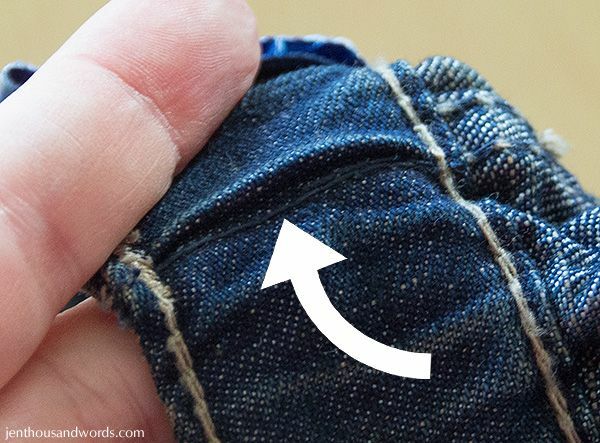 The same technique works on jeans, but you'll obviously only use one piece of elastic and it will be much wider. 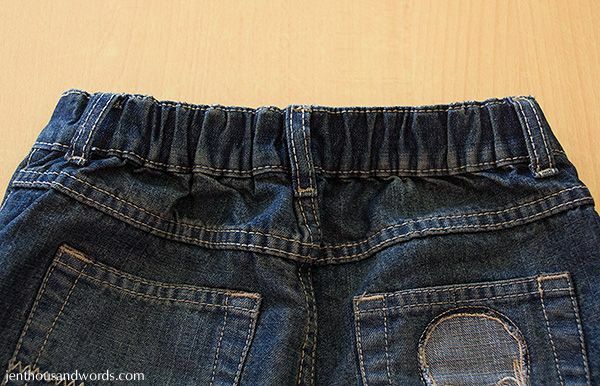 It works on jeans that are elasticated at the waist or just regular jeans. 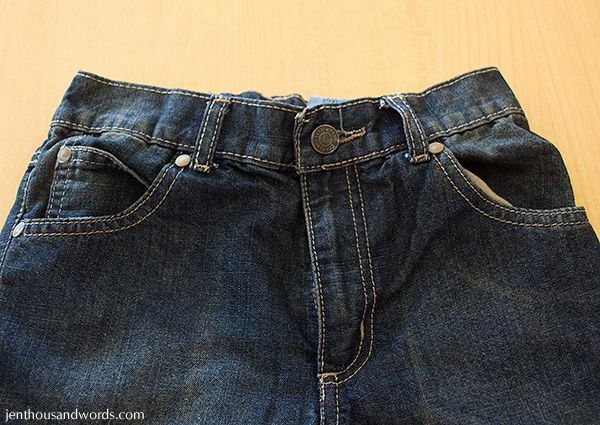 This pair of jeans is flat on the front but has an elasticated waist at the back. 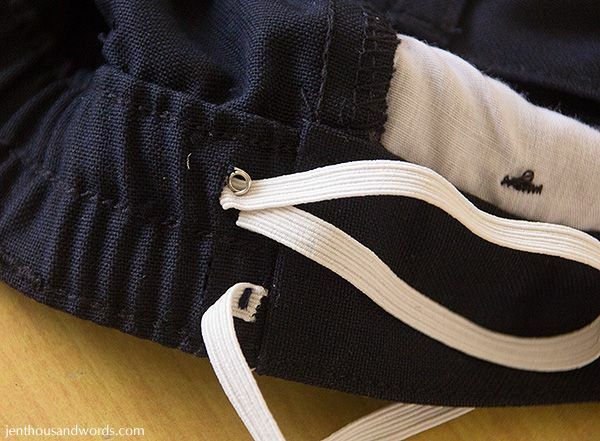 Why not just tighten the elastic that is already in the waistband? 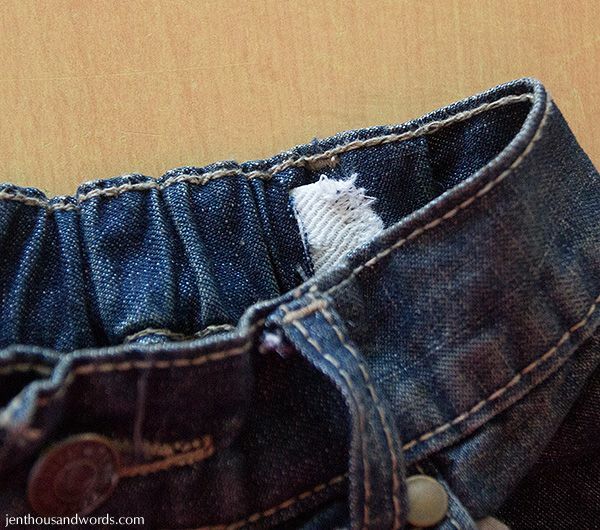 Because it's usually stitched down along the top and bottom of the channel. It's just easier to add your own. 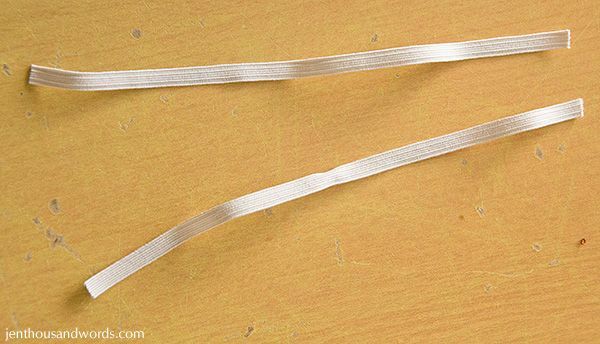 You'll start the same way, stitching down the elastic. 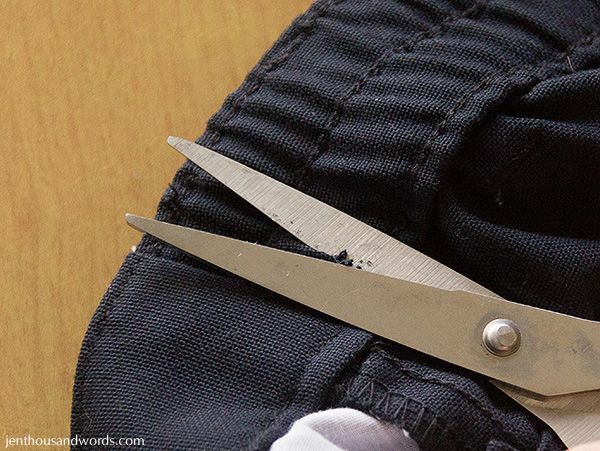 After your elastic is in place, cut your slit and thread the elastic through. 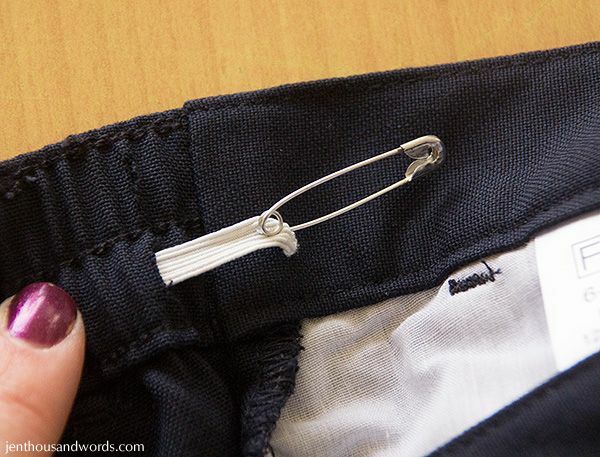 Tip: if you have problems with your safety pin coming undone inside the channel, use a piece of tape to seal it before threading it through. 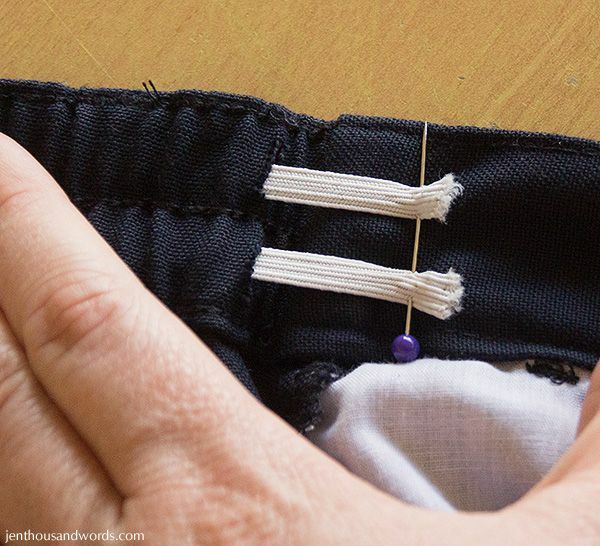 Halfway through the channel you might encounter a line of stitching. 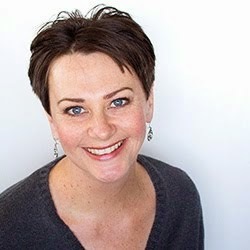 This can just be unpicked so that the channel is open. 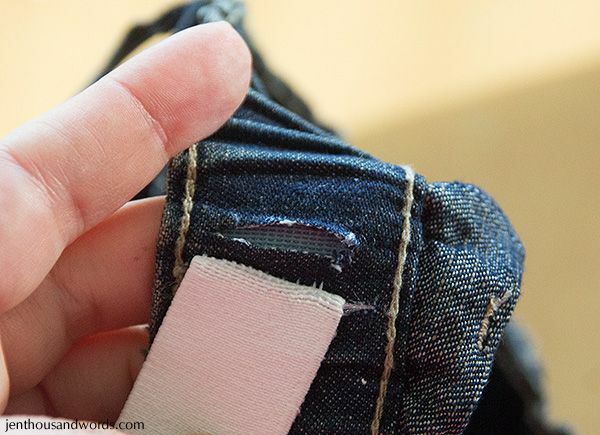 Come out the other side and stitch the elastic down, making sure the stitching falls behind another belt loop. 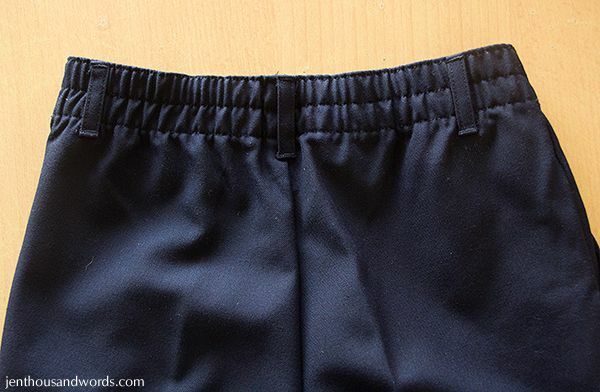 And there you go, a tighter waistband. 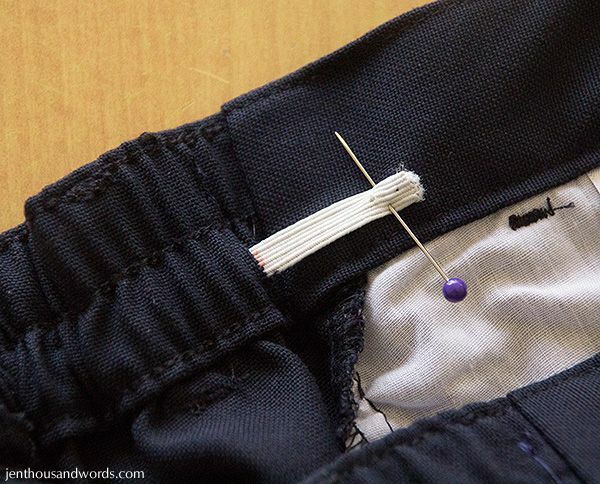 You could even take it a step further and make your elastic much longer, with buttonholes, and add buttons inside the waistband to make your own adjustable waist. But that's way too much hassle for me!